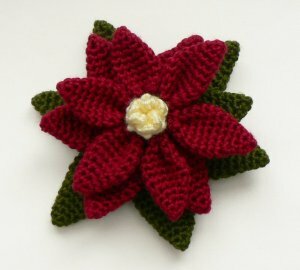 Poinsettia is an original crochet pattern by June Gilbank. Crochet a large poinsettia flower for Christmas - perfect as a table centrepiece or as a decoration. Or make a smaller one in fine yarn or thread to wear as a pin on your coat, a Christmas tree decoration, or anything else you can think of! Option: Try using a finer yarn or crochet thread with a correspondingly smaller hook to give a more compact flower, e.g. 2 strands of #8 perle cotton held together, and a B (2.25mm) hook, gives an approximately 2.75" diameter medium Poinsettia. Date Added: 04/13/2014 by lisa r.
Date Added: 03/17/2012 by Karen A. Date Added: 11/02/2010 by Ellen C.